I have to admit that pecan pie wasn’t always on my must-make list. 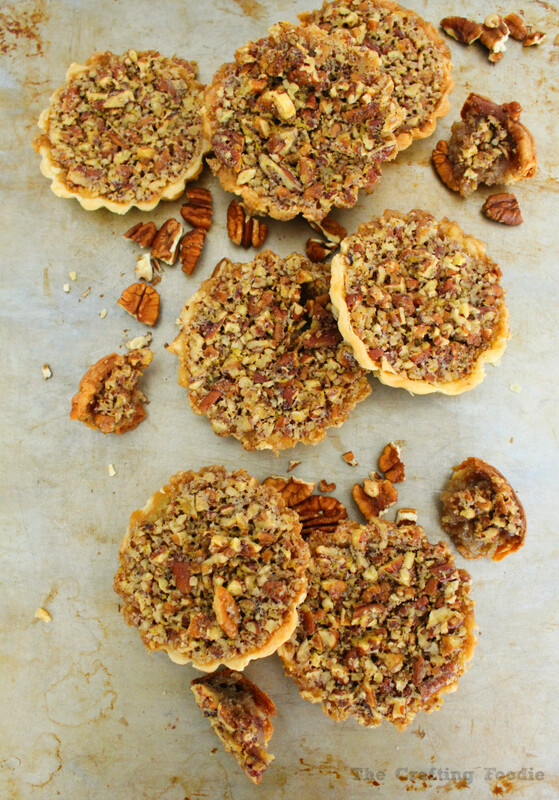 The gooey, way too sweet, mush on the inside of most pecan pies just isn’t my cup of tea. But there are some people (like my mom) who love the mush. 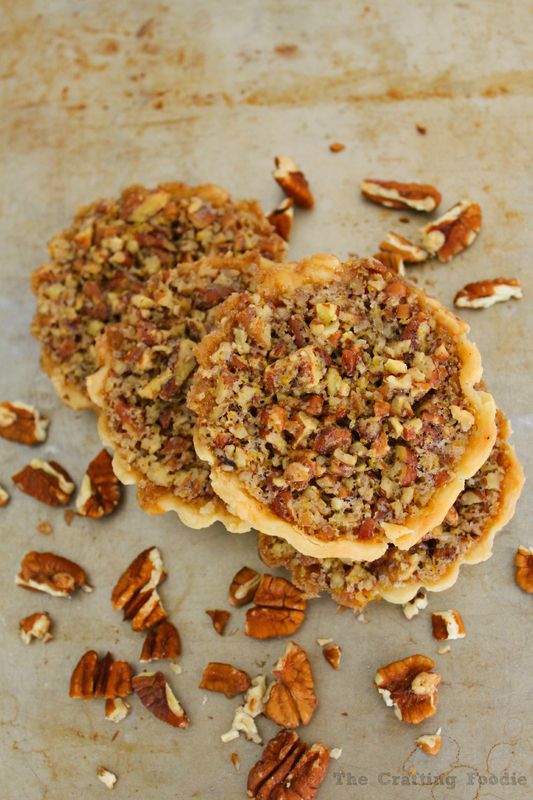 Anyhow, this recipe for Maple Pecan Tarts is without mush. Yup, no mush here. 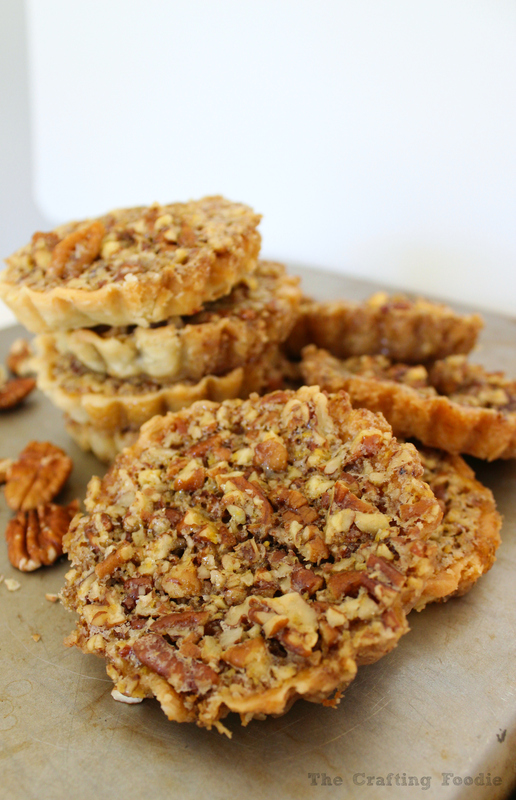 Instead, these Maple Pecan Tarts are jam packed with roasted pecans and a rich, not-too sweet, maple syrup filling. As the tarts bake, the filling caramelizes, and it’s the perfect combination with the flaky, buttery, crisp crust. You can make this into one 9-inch pie, but you know I can’t resist mini-desserts. Each one of these tarts is the perfect size for one person. All you have to do is add a dollop of whipped cream, or if you’re in a particularly decadent mood, you can add a huge scoop of vanilla ice cream! For the crust: Mix the flour , sugar, and salt in a medium bowl. Scatter the butter over the flour mixture, and using a fork, a pastry cutter, or your fingers, cut the butter into the flour mixture until it resembles course cornmeal. Sprinkle the egg white and water mixture over the flour and butter. Gently mix with a rubber spatula until the dough forms a ball. Flatten the dough into a disk. Cover it with plastic wrap and refrigerate for at least 1 hour. Once the dough is chilled, sprinkle flour over your work surface. Roll the dough out. Cut out the dough to fit into the tart pans. (I used 3½ inch mini-tart pans). Chill the pastry lined pans for at least 1 hour. Once the pastry lined pans are cold, place a layer of aluminum foil over each dough lined tart pan. Dock or prick the dough with a fork to form small holes. Refrigerate the dough while the oven preheats to 400 degrees F.
Once the oven comes to temperature, place pie weights (I use dried beans) in each tart pan. Remove the pie weights and foil, and bake for an additional 5 minutes. Allow the tarts to cool slightly while preparing the filling. For the filling: Melt the butter in a medium bowl. Mix in the sugar, salt, eggs, maple syrup and pecans. Fill each of the warm tart shells with the filling. Bake for about 25 to 30 minutes, until the filling is puffed. Remove from the oven, and allow the tarts to cool completely until removing the tarts from their pans. Thanks Taylor! 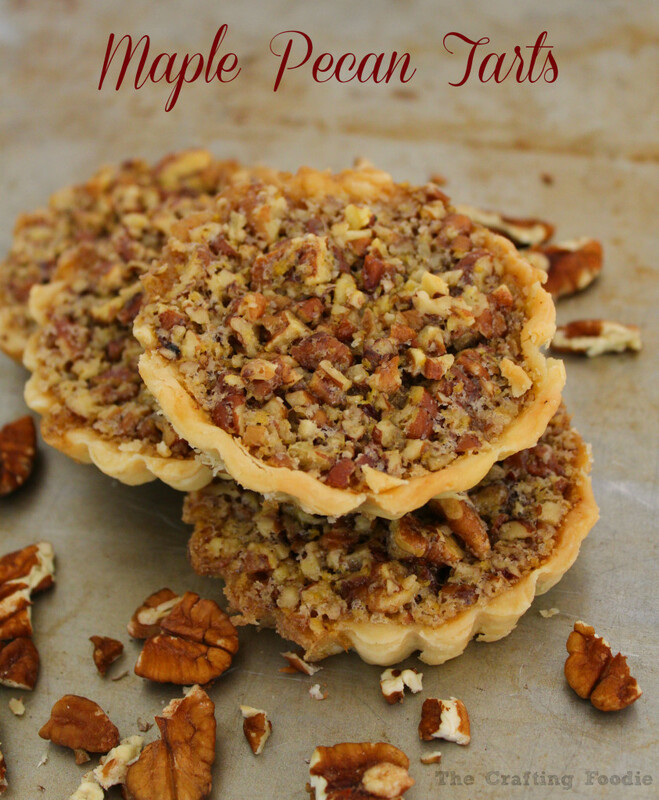 The maple syrup not only provides the right texture and sweetness to the tarts, but it also adds such a delicious flavor! Pecan pie is my ultimate favorite dessert ever! oh and anything with chocolate of course. These babies look awesome! Thanks so much Melissa! They’re pretty darn good! Thanks so much Cyndi! They are perfect for entertaining. Everyone has their own little tart! Oh my! These look so yummy, Aida! I love the holidays when I can indulge guilt-free, lol! Thanks for a great recipe 🙂 Pinned! Thanks so much Robyn! 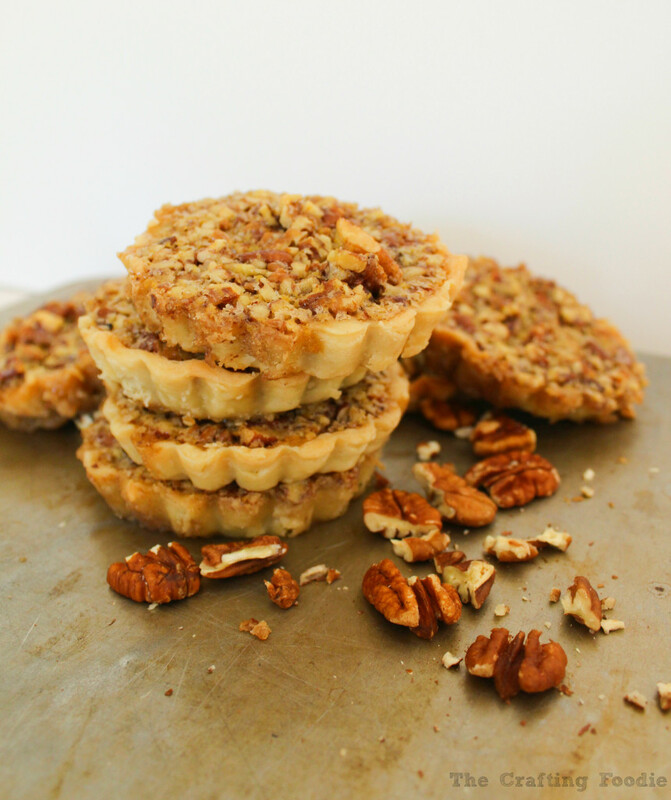 These tarts are dangerous around our house because they’re eaten way too easily! Aida, These look wonderful. I’m definitely putting these on my ‘to bake’ list. Pinning!